Are You Interested For Your Child to Learn Tagalog? Sign Up is Now Open for PAMANA Kantahang Pambata. The PAMANA Cultural Education Committee is inviting parents and grandparents with children or grandchildren ages 5 to 12 years old to encourage their kids to join our Tagalog kids singing group. 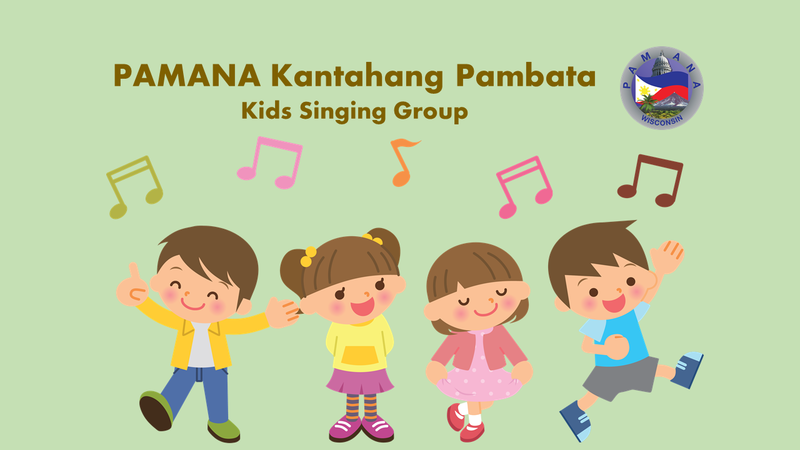 PAMANA Kantahang Pambata aims to introduce children to the Tagalog language through songs and instill an appreciation for the Filipino culture.They will learn one Tagalog song every month with a possible opportunity to perform at a future PAMANA event. All participants must register. Register your child/grandchild here. By signing up your child/grandchild to PAMANA Kantahang Pambata, parents agree to the Terms & Conditions of the Event Participation Agreement and Release and Waiver of Liability (“Release”) and the Video/Photograph Release. Parents will be required to turn in or sign these waivers on the the 1st day meeting attendance. The PAMANA Cultural Education Committee's goals are to promote and impart the Filipino tradition, culture and legacy by sharing practices, rituals, music, dance, food and literature through interactive presentation and activities. Questions? Please contact Jenny Ybanez.